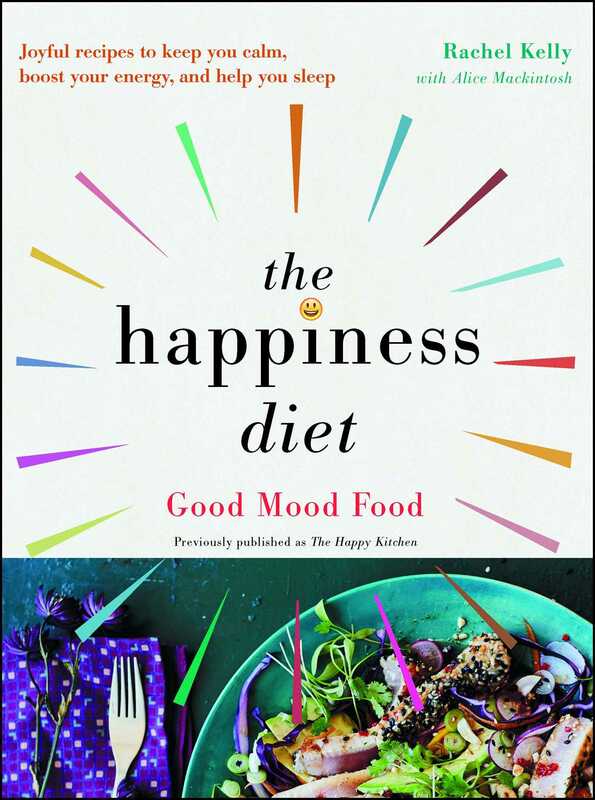 Improve your mental health and make yourself happier with this mood-boosting, life-changing, holistic nutritional plan that includes recipes, advice, and the science behind it from an internationally bestselling author and a nutritional therapist. There’s a reason that our stomachs are often referred to as our second brains: the gut is responsible for producing around 90 percent of a person’s serotonin, the chemical responsible for making you feel good. Since suffering from her last serious bout of depression in 2011, bestselling author and mental health advocate Rachel Kelly has developed a broad holistic approach to staying healthy and happy, and the heart of her recovery process involves a crucial shift in diet. Over the past five years, Kelly has worked with nutritionist Alice Mackintosh to identify the foods that either drag us down or lift us up. Together, they have built up a repertoire of over five-dozen recipes that target particular symptoms, from insomnia and mood swings to anxiety and exhaustion. In this bright, warm, beautifully designed cookbook with chapters ranging from Steady Energy and Beating the Blues to Hormonal Peace and Finding Comfort, they put all the theories into practice, explaining how you can incorporate these changes seamlessly into your daily life. Along with fantastic recipes and daily meal planners, each chapter features informative introductions explaining the nutritional science behind their advice. The Happiness Diet also offers cheat sheets of essential foods to incorporate into your diet, with comforting thoughts and inspirational quotes. Follow the advice in these pages, and even if it’s the only life change you make, you will begin to feel stronger and lighter with each passing week. Happy eating! I used to think of food as being physical fuel, or a way to celebrate special occasions. Now I am learning about the power of food, and its role in boosting our mental health. In recent years it has become widely accepted that we need to look after our mind in the same way that we look after our body. What is exhilarating is that changing what we eat is something we can do for ourselves. In the field of nutrition, new research and evidence is emerging all the time, and I have done my best to report what experts are discovering. The Happiness Diet also reflects my personal experience and how I have become calmer and more content by changing my diet. It is intended to be a gentle guide. I don’t want any rules to weigh you down. Anxiety and depression are individual experiences, and this means that the way we respond to treatment differs too. Some of what I share in this book reflects basic biology that I wish I’d learned at school: for example, how fluctuating blood sugar affects our adrenal glands, which can trigger bouts of anxiety. Other advice addresses the effect of particular foods on our nerves, brain, and digestion, which in turn affect our moods. There is a degree of truth to Hippocrates’s claim two millennia ago that “all disease begins in the gut.” Recently, scientists have advanced our understanding of the gut and its relationship with the rest of our body in fascinating ways. It is responsible for producing a large proportion of our neurotransmitters, the chemicals that communicate information throughout the body and brain. There are eight main neurotransmitters that affect our happiness, including serotonin and dopamine, sleep-inducing melatonin, and oxytocin, which is sometimes referred to as the love hormone. In fact, as much as 90 percent of serotonin is made in our gut, and around 50 percent of dopamine. The enteric nervous system, which is the part of the nervous system embedded in our gut, contains as many neurotransmitters as our brain. Much of the research on the links between anxiety and the health of our gut bacteria or gut microbiota has been done on mice. Indeed there are quite a few animal studies that find strong links between gut microbiota and anxiety-related behaviors. So cultivating a healthy gut may prove an important way to cheer us up. As well as supporting our immune system, a healthy gut digests vital minerals and nutrients. Without this basic function, you could eat all the Good Mood Food in the world, but still be unable to enjoy its full benefits. Our poor, tired brain needs nourishing too. I was amazed to learn that the brain uses about one quarter of our daily energy supply, consuming around 300 calories during the day and roughly the same number at night. No other animal has quite such a hungry brain. An ape would have to eat for around 20 hours a day to feed a brain of a relative size. I have summarized what I have learned about eating for happiness in my ten Golden Rules at the beginning of this book. These rules underpin the following chapters, in which I explain how to become more energized, more contented, less anxious, more clearheaded, more balanced, and a better sleeper by following a happy diet, and I include recipes that put the theory into practice. For me, this has led to a very happy kitchen. I hope it will make your kitchen happy too. "Hard to argue with a woman who proposes poetry as a means toward calm, and therefore happiness. She quotes Yeats’s 'The Lake Isle of Innisfree'...Try it. I took my blood pressure before and after. It dropped."